Featuring a large, high-contrast, 4.25" LCD display and Garmin's popular 12 parallel channel receiver, the GPS 128 gives navigators more than just a handheld without the bulkiness and high cost of most fixed-mount units. If you've got an enclosed bridge or cabin, the GPS 128's remote-mount antenna makes this unit your best bet. 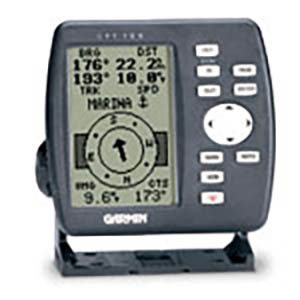 The GPS 128 also features a customized moving map display with user-selectable waypoint symbols and comments, and dedicated zoom keys to help to make operation straight forward and intuitive. User-selectable highway or compass navigation pages provide graphic steering guidance to your destination, eliminating the guesswork when you're trying to find your favorite hotspot.